The arts play a prominent role at YIS, both as an integral part of the curriculum as well as through a broad range of clubs and activities that excite students' imaginations and give them numerous opportunities for creative expression. Performance, exhibition and a fundamental understanding of theories are key components of our Performing Arts and Visual Arts programs. Students are given opportunities throughout the year to demonstrate their talents and passions, and to work with the YIS community and the larger society in which they live. The experiences change how they see the world, give them an opportunity to make their creative voice heard and allow them to make positive changes. The Performing Arts are a key contributor in building community at YIS. The skills and knowledge required to perform as an individual and as part of an ensemble are underpinned by the ethos of exploration, practice and collaboration. Courses and activities in music, drama, dance and film are offered in elementary, middle and high school throughout the year. In the Early Learning Center, students apply artistic skills daily as a form of expression in the Reggio Emilia-inspired approach. Annual events such as Play, Perform, Create; the high school and middle school drama production, the winter Japanese music concert, the elementary choir and ukelele group are just some of the avenues available to performance-minded students. The Tanner Community Ensemble, conducted by highly experienced international chamber musicians, provides professional-level performance opportunities to students of all levels. One of the distinctive musical offerings at YIS is our Japanese music program. The program, which focuses on the koto (a stringed harp-like instrument) and is offered for students in grades 4 - 12, seeks to foster understanding and appreciation of traditional Japanese music through education and performance. 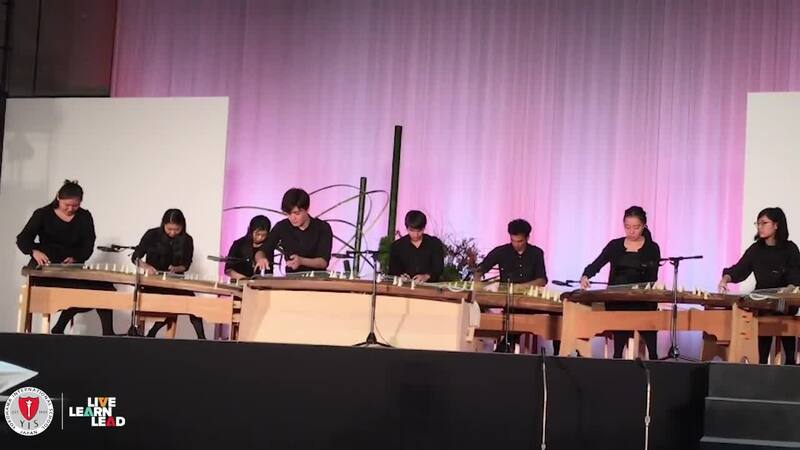 Our koto ensembles have performed at concert halls, temples and other venues throughout Japan and overseas, and have been awarded prizes in several key national music competitions, while individual members have been honored with top solo awards. Our Visual Arts and Design programs are intrinsically linked to provide students with genuine, relevant opportunities to interact with the surrounding culture and community. Our shared physical studios and interdisciplinary curriculum encourage students to understand the universal creative grammar that underpins all art and design. In addition to conceptual understanding, students are provided with an environment that fosters experimentation and risk-taking to enable informed decision-making on materials and techniques, and create outcomes that really push their ability as creators. Our Visiting Artist Program invites a variety of creators and designers on campus each year to share their expertise and provide insight on real world innovations and concepts. We believe in extending creativity outside of the classroom, allowing students to see the exciting opportunities their interests and ideas can lead to. After school activities such as the Design Store, gallery visits, research trips and our annual charity Staff & Parent Exhibition connect the curriculum to the vibrant creativity of Yokohama and Tokyo.